Frosted Winter Race is a sport game provided by www.bestgames.pk. Your objective in the game is to drive your car to the final line. Up arrow is for moving forward and down arrow for brake. Use the key Z for the health kit and X for the speed boost. Collect the coins and medicine bags along your way forward. Damage indicated number of cars to get into the next level. You can upgrade your equipment after each level. Ready? Go! Rapunzel has a new passion. She loves bracelets but not any kind of bracelets. She really likes Pandora bracelets and today we need to help Rapunzel design her one of a kind accessory. Take a look at the great variety of colored beads and choose the ones that you like the most. 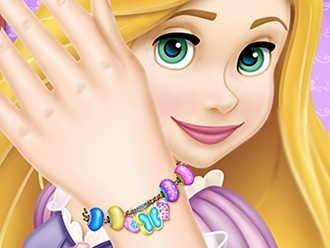 With your help, Rapunzel will have a unique and special Pandora bracelet. Enjoy! Coaster Racer is here on www.bestgames.pk. Join this racing game to entertain yourself! Press the up key to accelerate, the down arrow to brake and the left and right keys to steer. You can also use the keys WASD for the same purpose. N is for nitro when the middle button flickers. M is for freestyle. Pay attention to the road sign. Try to collect the coins along your way. You must rank high enough to unlock letter levels. Now, let’s go! Visit www.bestgames.pk to join the free sport game Moto Tomb Racer 2. You are going to drive a motor in the pyramid in this game! Race forward with the up key and tilt with the left and right arrows. Alternatively, you can use WASD. Press the space bar to speed up. Q is for direction change. Pick up treasures by touching them. Press the key M to check the map. Protect the hero from dangers. The items at the bottom show your status. Good luck! Visit www.bestgames.pk to play the racing game Superbike Racer. Your objective is to win the race. Up and down arrows are for controlling your speed and press left and right keys to tilt. Long hold the up keys to get the highest speed and space bar is for jet boosting. Try to be the first and you will get full stars and money. You can upgrade your equipment after you finish a level. Ready? Go!